A recent study published in Science Advances reveals a method to manipulate graphene to create the world’s most light-absorbent material for its weight. The material is nanometer-thin and will facilitate futuristic applications such as 'smart wallpaper', which could produce electricity from waste heat or light, and power many applications within the increasing 'internet of things'. A team of researchers from the University of Surrey's Advanced Technology Institute has created ultra-thin graphene sheets that are configured to capture maximum amount of light. They used a method called nanotexturing to grow graphene around a textured metallic surface and their creation was inspired by moth eyes. Graphene is highly sturdy even though it is just one atom thick. Also, it is conventionally thought to be poor at absorbing light. To overcome this issue, the team used nano-patterning to localize light into the constricted spaces between the textured surface, thus ensuring that nearly 90% of light is absorbed by the material. Nature has evolved simple yet powerful adaptations, from which we have taken inspiration in order to answer challenges of future technologies. Professor Ravi Silva, Head of the Advanced Technology Institute. Moths' eyes have microscopic patterning that allows them to see in the dimmest conditions. These work by channeling light towards the middle of the eye, with the added benefit of eliminating reflections, which would otherwise alert predators of their location. We have used the same technique to make an amazingly thin, efficient, light-absorbent material by patterning graphene in a similar fashion. Graphene is already well-known for its exceptional mechanical strength and electrical conductivity. However Professor Ravi's team believes that only if graphene is capable of harnessing heat and light effectively, it can be considered as a potential candidate for futuristic applications. Solar cells coated with this material would be able to harvest very dim light. Installed indoors, as part of future 'smart wallpaper' or 'smart windows', this material could generate electricity from waste light or heat, powering a numerous array of smart applications. New types of sensors and energy harvesters connected through the Internet of Things would also benefit from this type of coating. Lead author of the paper, Dr José Anguita from the University of Surrey commented: "As a result of its thinness, graphene is only able to absorb a small percentage of the light that falls on it. For this reason, it is not suitable for the kinds of optoelectronic technologies our 'smart' future will demand." "Nanotexturing graphene has the effect of channeling the light into the narrow spaces between nanostructures, thereby enhancing the amount of light absorbed by the material. It is now possible to observe strong light absorption from even nanometer-thin films. 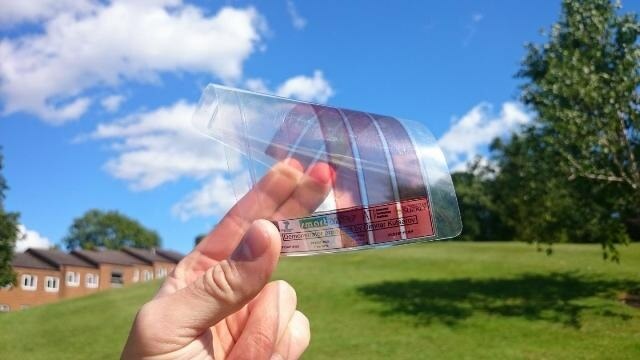 Typically a graphene sheet would have 2-3% light absorption. Using this method, our ultrathin coating of nanotextured few-layer graphene absorbs 95% of incident light across a broad spectrum, from the UV to the infrared." The next step is to incorporate this material in a variety of existing and emerging technologies. We are very excited about the potential to exploit this material in existing optical devices for performance enhancement, whilst looking towards new applications. Through Surrey's EPSRC funded Graphene Centre, we are looking for industry partners to exploit this technology and are keen to hear from innovative companies who we can explore the future applications of this technology with us. The team from Surrey partnered with BAE Systems to produce this technology for infrared (IR) imaging in opto-MEMs devices.